If you fancy stargazing, sci-fi fun and live music from some rock royalty you might want to head to the Welsh border in August. Former members of Hawkwind will entertain attendees at Solarsphere. 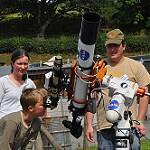 It’s a festival which mixes astronomy talks and a planetarium with sci-fi fancy dress competitions. It is being held at a campsite on a working farm near to Builth Wells. It runs from the 12th to the 14th of August. Keri Jones of the Great Destinations Radio Show spoke with the organizers of the 3-day Solarsphere, Pete and Sarah. Listen to their discussion, here.